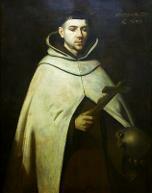 John of the Cross (Spanish: San Juan de la Cruz; 1542[ – 14 December 1591) was a major figure of the Counter-Reformation, a Spanish mystic, a Roman Catholic saint, a Carmelite friar and a priest, who was born at Fontiveros, Old Castile. He was the spiritual director to St Teresa of Avila and important in the development of the reforms of the Carmelite order of Nuns and that of Friars. His complete poems add up to fewer than 2500 verses but two of them—the Spiritual Canticle and the Dark Night of the Soul—are widely considered masterpieces of Spanish poetry, both for their formal stylistic point of view and their rich symbolism and imagery. His theological works often consist of commentaries on these poems. The Dark Night narrates the journey of the soul from its bodily home to union with God. It happens during the night, which represents the hardships and difficulties met in detachment from the world and reaching the light of the union with the Creator. There are several steps in this night, which are related in successive stanzas. The main idea of the poem can be seen as the painful experience that people endure as they seek to grow in spiritual maturity and union with God. The poem of this title was likely written in 1578 or 1579. In 1584-5, John wrote a commentary on the first two stanzas and first line of the third stanza of the poem.